​The South Carolina Department of Transportation (SCDOT) announced its award of the Volvo Interchange Design-Build contract to Conti Enterprises, Inc. 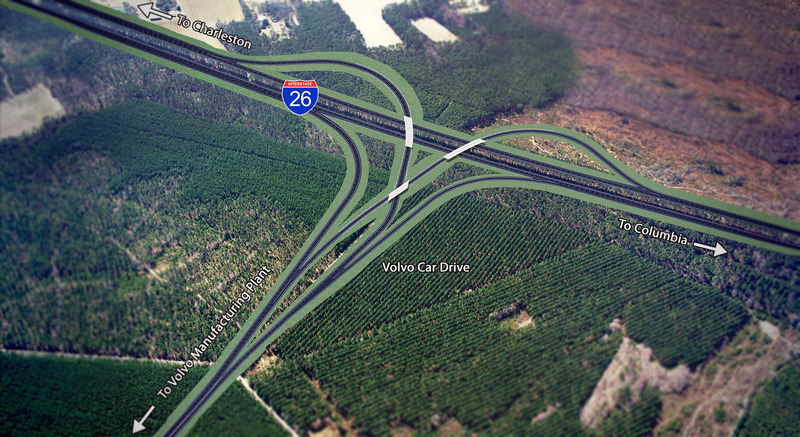 The $44 million project calls for the construction of a new interchange on I-26 in Charleston, South Carolina to connect the highway to Volvo Car Drive. Conti teamed with design partner Johnson, Mirmiran & Thompson (JMT). Located between the Ridgeville Road exit (187) and the Jedburg Road exit (194), the project supports Volvo’s new car manufacturing plant, which broke ground in September 2015. At that time, the company announced that it intends to create 2,000 jobs at the plant over the next decade, and the plant will eventually be capable of producing 100,000 cars per year. In a release issued by SCDOT, Secretary of Transportation Christy Hall said the interchange project is a prime example of how transportation supports economic development in the state. “Volvo recognized South Carolina’s favorable business climate in selecting this location which includes an existing interstate highway and proximity to the Port of Charleston. The construction of this interchange is an important step in providing an interconnected system for driving the state’s economic engine” said Hall. This win builds on Conti’s ongoing and recently completed infrastructure construction projects in the Carolinas, including the redevelopment of a former Naval depot site for Palmetto Railways and two roadway and bridge developments for the North Carolina Department of Transportation.